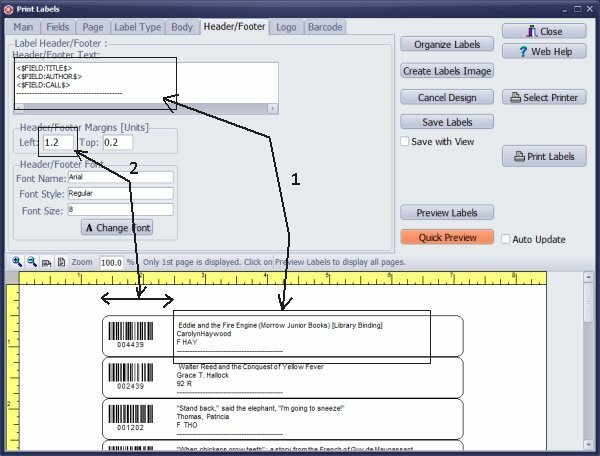 ﻿ Handy Library Manager: How to print actual bar codes in the library report? Help, how to topics > Print reports > How to print actual bar codes in the library report? 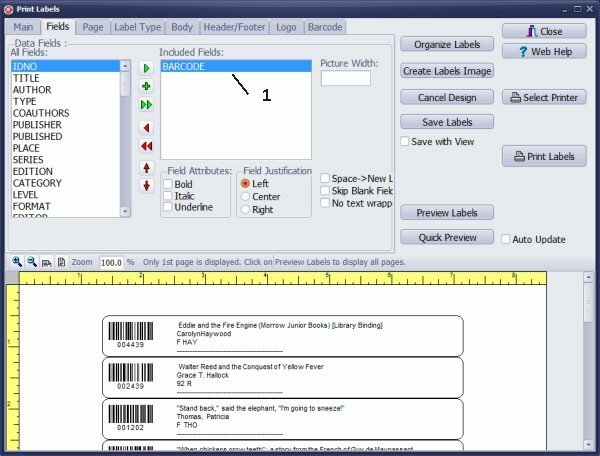 How to print actual bar codes in the library report? 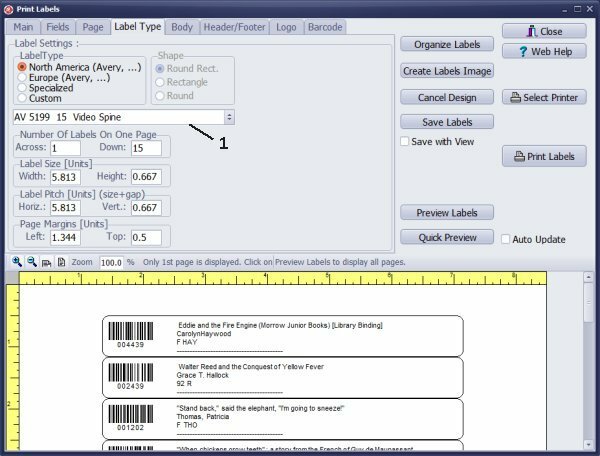 This report sample explains how you can create a report that includes actual item's bar codes. It is currently not possible to print the bar codes in the reports. They can only be printed on labels. The first sample shows how to use the header/footer feature with data fields (list one record per row). The second sample shows the regular label set up. Open the Library Main Catalog window. In the Labels box select NEW LABELS. Scroll down and up in the All Fields box and select the BARCODE (1) data field. You would have to select the type of labels that have sufficient width to include all data fields. Open the Label Type page select the type (1) that offers wide labels. 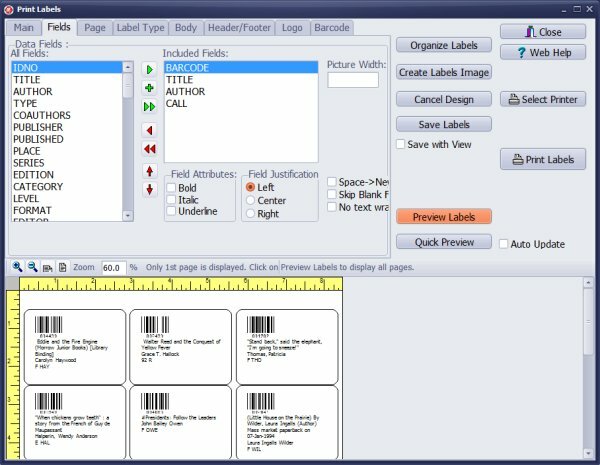 You can also create a customized label type. Use the Header/Footer tab to include item’s additional information on the report. Define the left margin, so the data is displayed after the bar code. Print the defined labels on plain paper. The format may not be exactly what you want but you will be able to scan in the barcodes from it. You can print the same report in the diffent layout, 3 records per row and 5 rows on one page. We selected AV 6490 15 Diskette label type, it offers 15 labels, 3 across and 5 down. This label type have sufficient height to include all data fields in the Included Fields box. Question: Is it possible to print the actual bar codes in reports? 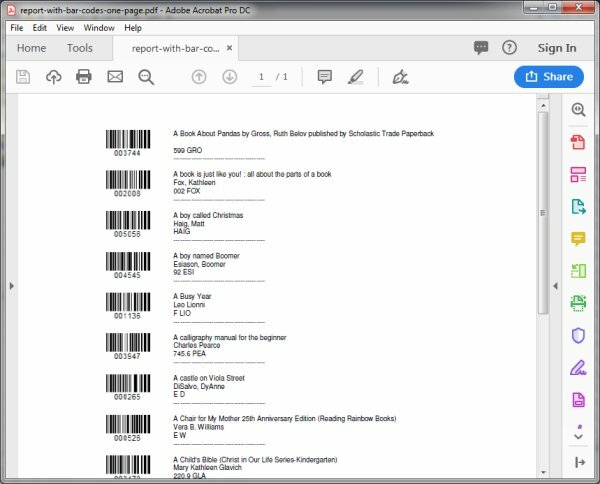 How to create a report with bar codes printed. We are evaluating your software and I have a question regarding a report I designed to manage reservations. In the first column I included BARCODE, is there a way to print the actual bar code so we could use a bar code scanner with this report?